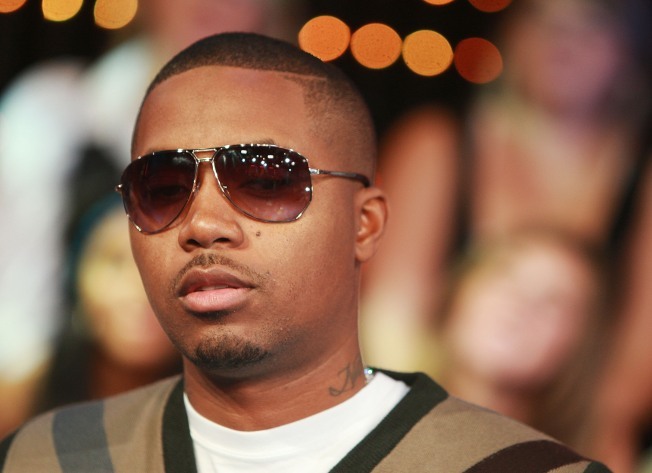 Hip-hop music artist Nas appears on stage at MTV's TRL at MTV Studios. The son of jazz musician Olu Dara and an eighth grade drop out now has no problems selling out shows across the country. Nas, born Nasir Jones, traded his classroom education for an education from the rough streets of the Queensbridge projects, long fabled as the former stomping ground of Marley Marl and his Juice Crew as immortalized in "The Bridge." One of hip hops biggest acts, Nas will play the Warfield in San Francisco this Friday and tickets are still available. Nas first drew prominence with his debut album "Illmatic." Whether proclaiming himself "Nasty Nas" or "Nas Escobar" or "Nastradamus" or "God's Son," the self-appointed King of New York battled numerous adversaries for his position atop the epicenter of East Coast rap, none more challenging than Jay-Z, who fought with Nas for the vacated throne when Notorious B.I.G. 's was killed in 1997. Nas had settled on pursuing a career as a rapper, and as a teenager enlisted his best friend and upstairs neighbor Willy "Ill Will" Graham as his DJ. For four years, Nas and Jay-Z attacked each other in their songs. The two New York rappers formally ended their rivalry through duet performances at concerts sponsored by New York City-area hip-hop radio stations. Nas' work has influenced, and been admired by many in the hip hop community, including Kanye West, 50 Cent, Eminem and even Jay-Z himself. For tickets to Friday's show visit Goldenvoice.